This paper presents a new line-measurement method for three-axis CNC (computer numerical control) vertical machining center. The measurement method measures the twenty-one geometric error of the numerical control machining center through using the laser interferometer and ball bar. The objective of this research work was to illustrate the measurement method (a line measurement method for geometric error measurement), measurement system and testing results with specific experimental conditions that may provide an easy way to measure the geometric errors. To estimate the geometric errors of the machining center, both direct and indirect measurement methods are used to predict the errors. The ball bar is used to measure the squareness errors of the machining center. The linear, angular and straightness errors estimated by the laser interferometer provide the particular reference value at the same time on the numerical control machine tool and geometric precision detection. Therefore, the twenty-one geometric errors of the machining system that reflect on machine tool can be predicted by a line measurement method which comes up convenient and time-saving way as compared to others line methods such as 12th line, 13th line and 15th line etc. The ​original ​version ​of ​this ​article ​was ​revised: With the authors’ decision to step back from Open Choice, the copyright of the article changed on 5 April 2019 to © Springer Nature Switzerland AG 2019 and the article is forthwith distributed under the terms of copyright. A correction to this article is available online at https://doi.org/10.1007/s42452-019-0387-6. The micro-manufacturing technology industry today is based on higher dimensional accuracy, tight tolerance, surface finish, and the geometric accuracy of manufactured parts. Precision manufacturing has become a fundamental importance in modern manufacturing sectors . Therefore, methodologies for producing specific components efficiently and cost-effectively are significant topics of interest for manufacturing development. New identification and evaluation methods are being continuously improved and developed to increase the precision and performance of machine tools . Geometric errors are significant factors that cause inaccuracies in the machining centers . There are in total of 21 position-dependent geometric errors (PDGEs) in machining centers. A linear displacement in the Y-axis leads to a position error in the Y-axis, two straightness errors between the X–Y and Z–Y axis, the squareness errors between every two axis X–Y, Y–Z and Z–X, and three rotational errors in each axis: a pitch error, yaw error and roll error . Direct measurement and indirect measurement tend to be the main methods used to find errors. The direct measurement method finds the error for a single axis observed at one time. Interferometer, different artefact, and inclinometer are a few devices used to measure errors directly . While in the indirect measurement method, the movement of the two axes takes place at the same time. The ball bar and laser tracker are the devices used to take the measurements . The researchers have developed different methods to measure the geometric error. Eman et al. presented a way to shape a general error model of a multi-axis machine of arbitrary configuration. Based on the author’s assumption, the machine tool has rigid body motion on which the homogeneous transformation matrices are developed. Yu et al. presented the geometric error modelling based on screw theory that can be used to make a linear error model efficiently and accurately. They have demonstrated the model on the 2-DOF mechanism. Xiang et al. presented a systematic way to detect and compensate the geometric errors. An efficient test on the ball-bar with a 45° segment is intended to decouple the position-dependent and independent geometric errors for the non-orthogonal rotary axis. The geometric errors of translational axes have been measured by step-size body diagonal tests based on a laser interferometer. The volumetric error is anticipated and compensated based on the screw theory. The 9-line measurement method has used the equations to measure the twenty-one geometric errors in the machining center which was quite complicated to understand. Mostly this method is used to find the linear position error as well as the straightness error. However, this method has influenced the squareness error. The disadvantage of this method is the influence of the straightness error on angular errors . The 12-line measurement method has additional three face diagonals with 9 linear lines. The measurements have been taken along the X–Y, Y–Z and Z–X face diagonals. This method has a drawback; it did not consider the effect of the angular error on bi-axial movement on face diagonals  . In the 13-line measurement method, the first 12 lines are measured the same way as in the 12-line measurement method. It has an additional body diagonal measurement that is taken having tri-axial motion. Until now, the 13-line method is the latest and most updated method, which discusses all the previous errors such as straightness and angular error. Moreover, pit error in guideway has also been addressed in this method  although the diagonal body measurement is not easy to measure in this method. Chen et al. presented a method to detect the 21 geometric error components by performing displacement measurements along 15 lines using laser interferometer. The authors provided a 15-line measurement method, which shortens the Zhang’s 22-line measurement method. Chapman  discussed the defects of diagonal body measurements as if the measurements of the diagonal body were along the four-body diagonals. The results produced on the machine would either give a better diagonal resulting in the poorest volumetric efficiency or a better volumetric efficiency producing the poorest diagonal result. Therefore, it carries volumetric error and influence of angular error in the linear axis as well as multi-axis motion, thus giving more error budget. Zhang  presented the line method that measures displacement error along 22-lines in a volume. It is quite complicated to take values on 22-lines. In the 14-line measurement method, the squareness errors are considered equal to zero which makes it non-applicable, because it is impossible for a machine with zero squareness error. Therefore the 14-line method is obsolete and not applicable. This paper measures the 21 geometric errors of the machine tool by using the line measurement method with the help of a laser interferometer and a ball bar apparatus. The method measures the geometric error in the linear axis of the CNC (computer numerical control) machining center. The previous work on the line method with equations is a little complex. It has influenced the squareness and angular errors that affect the results. The diagonal measurement is used in other methods, which has given good diagonal results in producing the poorest volumetric efficiency. To overcome the problems mentioned above, the volume of the machine tool has to be divided into four parts which provide the shape of four triangles in each axis. This paper presents a convenient and straightforward method to measure the errors of the machining center. This method is a software-based compensation in which the measurement of the geometric error has been taken by using the 9-lines at different places in the given volume of the machining center. The ball-bar apparatus is used to measure the squareness error between the X–Y, Z–Y and Y–Z planes. The measurement method adopted here determines the precise path lines, which are placed in the bottom, middle and top of the volume of the machine tool. 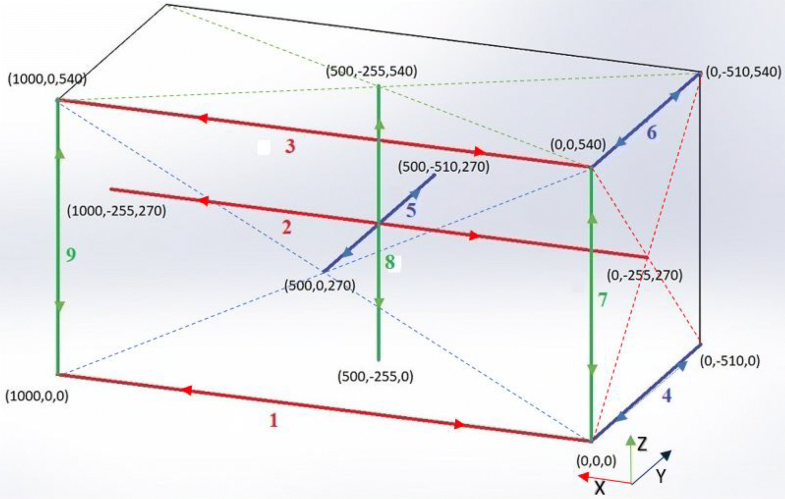 A method for specific data collection, which measures the twenty-one geometric errors of the machine tool, required to define the particular experiment perimeter on each line. The finding of the geometric errors for the machine tool, the displacement path line for measuring the geometric errors as shown in Fig. 1. In this method, values have been taken on different lines which appears like the shape of a triangle as along for X-axis values are taken on line 1, 2 and 3 for Y-axis values are made on 4, 5 and 6 whereas along for Z-axis values are taken on tracks 7, 8 and 9. The squareness error measured where line 2, 5 and 8 intersect each other by using the ball-bar apparatus, measure the squareness error in the X–Y, Y–Z and X–Z. The detailed methodology is set according to lines perceived when testing and taking the measurement shown in Fig. 1. The required measurement data content of each line and the twenty-one geometric errors characterized into three-core experiment content that has been divided into positional displacement error, angular error and straightness error measurement as shown in Table 1. RX10 is a precise Hirth coupled indexer that allows rotational axes to be calibrated to laser accuracy. The RX10 rotary axis calibrator is used for the measurement of the rolling error by the laser interferometer. The setup consisted of a laser interferometer with angular reflector, a reference rotary indexer and an appropriate rotary axis calibration software. Using laser and optics to measure the rolling errors in a rotary axis and record them by the calibration software . The Renishaw defined the essential steps, which should be taken before starting the experiment. To measure the positional error, angular error and straightness error on the machine tool to complete the measurement process. The detailed experiment process can be determined, which should be collected with the actual machine tool and line method are in detailed as follows. The new line measurement method developed based on the diagram of the line measurement method shown in Fig. 1. In which the specific lines have been drawn in the volume of the machine tool, according to lines, which has mainly synchronised with the actual movement of the machine tool. Before starting the experiment, the machine tools needed to be on idle running for at least 30–45 min , to test the actual movement of the machine tool. Therefore, consider the required space for mounting the optical instrument on the machine tool, the feasibility of the environment and make sure the required method of line measurement produced . After, conducting the test of the actual movement of the machine tool. Check the mounting feasibility for the measurement setup. Assembled the laser optics on the machine tool and made the alignment correctly in such a way, so that there would be no misalignment error in the results (especially removed slope for long distance while taking straightness value). To make the program on Renishaw software for capturing data while measuring the required line concerning desired error. In a similar manner developed the program using G codes on the NC controller for measuring the desired error on lines and set the target point for each required line. The measuring instrument optics and software assembled, which shown in Figs. 2 and 3. The alignment made between the optics was checked and corrected by using the signal strength of the laser beam. Subsequently, the positional, straightness and angular error data were obtained. In the process of capturing data, repeatability, backlash, effectiveness and correction, to make sure the following data collections was checked, the detail about the errors on each line as shown in Table 1. The measurement arrangement of the experiment was determined as the positional error, angular and straightness error. The squareness error would be measured by using the ball bar apparatus. The Experimental setup for ball bar is easy and convenient by following these simple steps; install the center mount on the machine table and mount the magnetic tool cup into a suitable tool holder with the spindle. The setting ball used to set the offset of the machine tool, which was applied for alignment between the mount center and tool cup on the desired position. Synchronise the QC20-W wireless ball bar with computer system after that follow step 3 mentioned above. 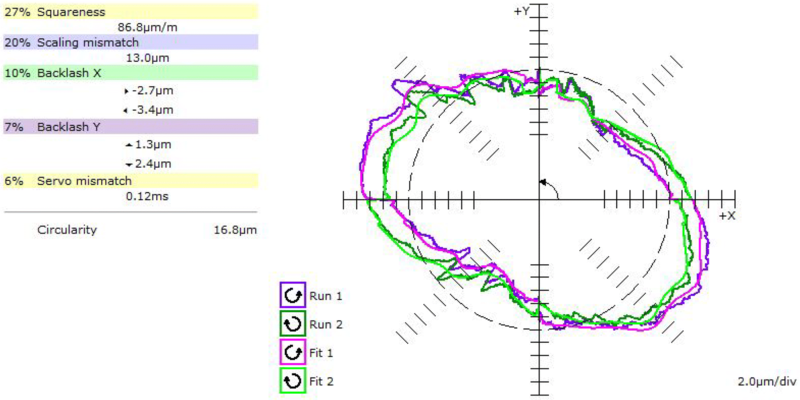 The data collected from the laser interferometer and ball bar, the measurement for each axis saved and analysed by the Renishaw analysis software. The error as shown below in Y-axis similarly, to find the 21 geometric error of three-axis NC machining center. 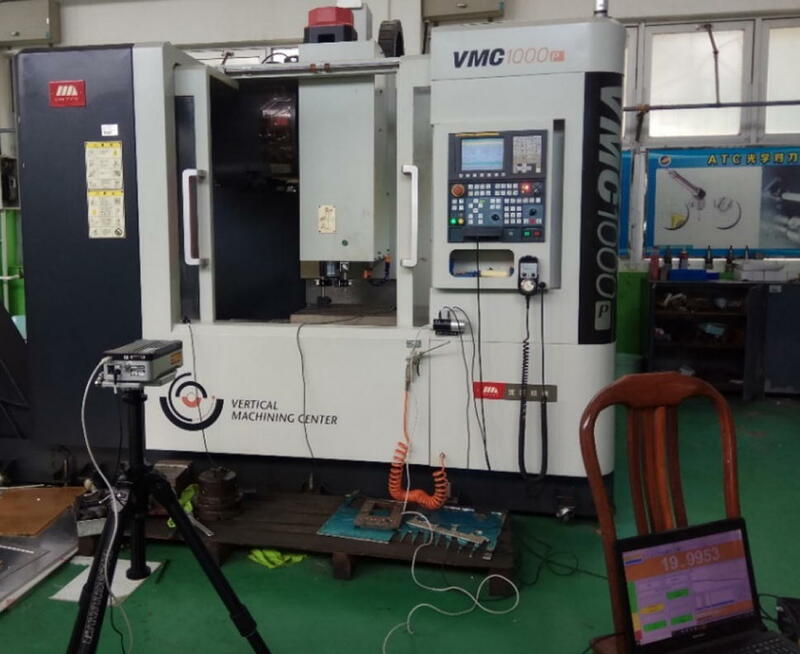 The values were taken five times in bidirectional to minimize the chance of various other factors, which could influence results after that calculated mean of those values, could use for the compensation of NC machining center. The positional error on the y-axis is measured by using the laser interferometer with linear optics. The graph in Fig. 4 shows the results of linear position errors in the y-axis, which is in the range of 0.003 mm to − 0.006 mm. The maximum values of the positional errors are in the negative, which means the machine is lacking to reach the required position. But initially, the machine has overrun from the required position. G-codes are generated in such a way to minimize the effect of the backlash on the measured values. The maximum positive repeatability observed is 0.0018 mm at target 26, maximum negative repeatability measured is 0.0016 mm at target 23 and maximum bidirectional repeatability detected is 0.0034 mm at target 3. The overall accuracy measured in the y-axis was observed as 0.009 mm in the linear analysis. The values had taken five times in bi-directional on the y-axis. The graph indicates the positional error, which could eliminate by doing composition. 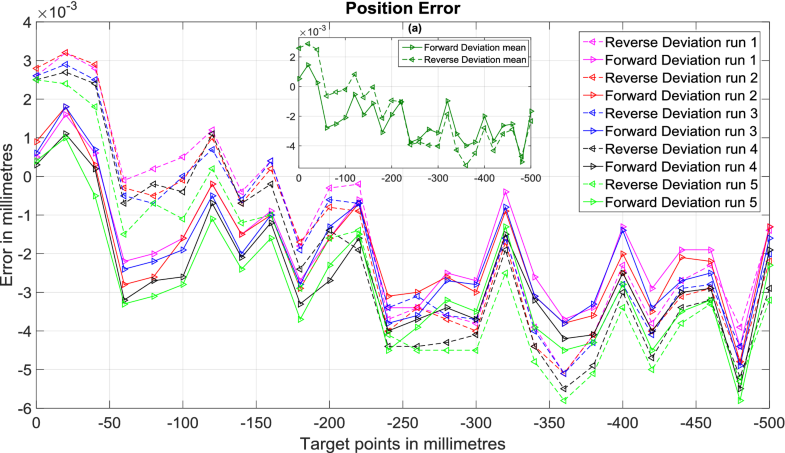 Figure 4a shows the mean deviation of the positional error in the forward and reverse direction of the y-axis. The angular errors on the y-axis are measured using the angular optics with a laser interferometer. G codes generated in such a way to remove the backlash error from the measured values. The yaw and pitch errors are shown in Figs. 5 and 6 respectively. The yaw error on the y-axis results shows the range which is from − 3 to 6 arc-seconds. The overall accuracy of the yaw measured on the machine tool detected as 9.0 arc-seconds in the y-axis. The maximum positive repeatability recorded as 2.1 arc-seconds at target 17, maximum negative repeatability noted as 1.7 arc-seconds at target 26 and maximum bi-directional repeatability observed as 3.4 arc-seconds at target 24. 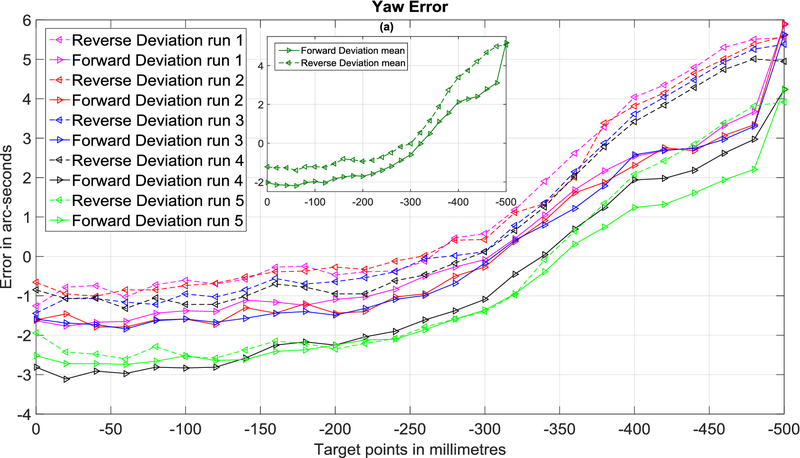 Figure 5a shows the mean deviation of the yaw error in the forward and reverse direction of the y-axis. The yaw error moves on both side of the y-axis clearly shown in the graph. 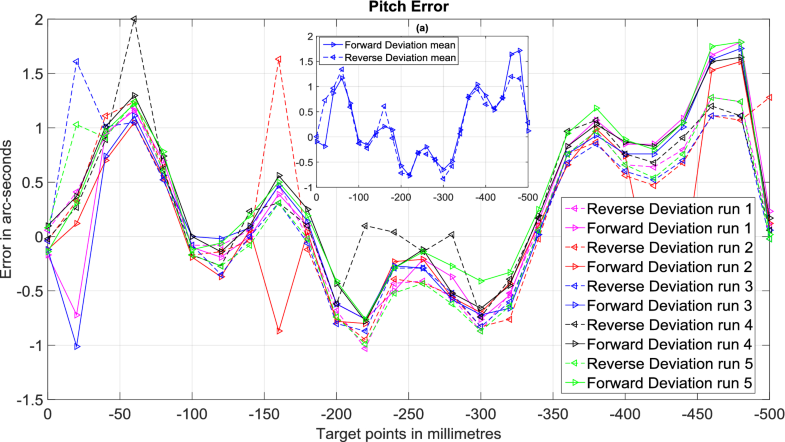 The pitch error on the y-axis results showed the range from −1 to 2 arc-seconds. The overall accuracy of the pitch error of the machine tool in the y-axis, which is observed as 3.0 arc-second. The maximum positive repeatability was detected as 1.3 arc-seconds at target 2, maximum negative repeatability was recorded as 1.4 arc-seconds at target 23 and maximum bi-directional repeatability was measured as 2.6 arc-seconds at target 2. Figure 6a shows the mean deviation of the pitch error in the forward and reverse direction of the y-axis. The jumps in the graph can be ignored because it is manually reading so to minimize the effect of these jumps on the taken results, the reading is taken five-times in bidirectional of the y-axis. The straightness errors of x-axis and z-axis concerning the y-axis are measured by using the short-range straightness optics with a laser interferometer. The straightness errors in the x-axis and z-axis are shown in Figs. 7 and 8 respectively. The graph shows the results of straightness errors in an x-axis while moving the machine in the y-axis, which is in the range of − 0.05 mm to 0.05 mm. The behaviour of the chart indicated that straightness error increased in a positive direction mostly as its moving away from the origin point. The overall accuracy of the x-axis straightness error of the machine tool in the y-axis was observed to be 0.2252 mm. The maximum positive repeatability was detected as 0.1473 mm at target 18, maximum reverse repeatability is recorded as 0.1137 mm at target 13 and maximum bi-directional repeatability was measured as 0.1473 at target 18. 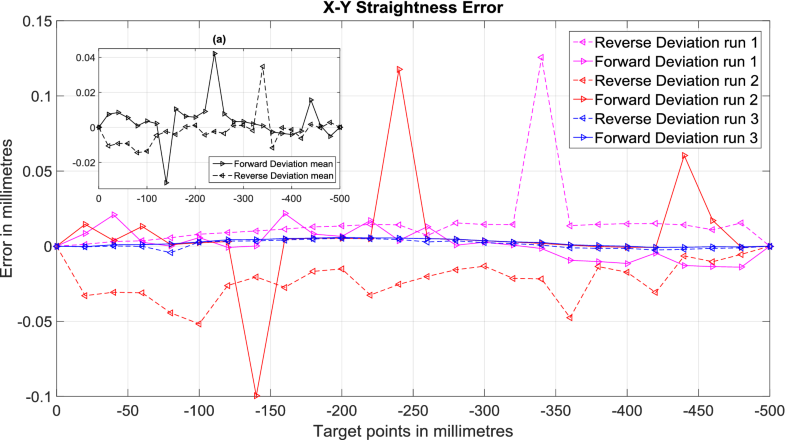 Figure 7a shows the mean deviation of the x-axis straightness error in the forward and reverse direction of the y-axis. 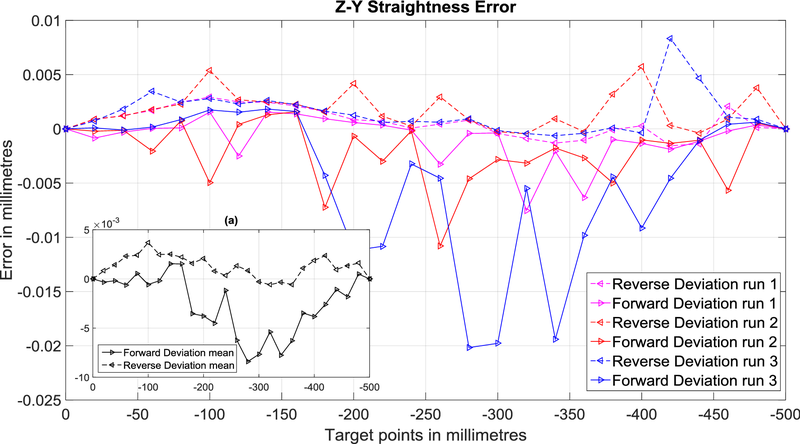 The graph shows the results of straightness errors in z-axis concerning the y-axis, which is in the range of 0.005 mm to − 0.01 mm; the behaviour of the chart indicated that straightness error increased in the negative direction as its moving away from the origin. The overall accuracy of the z-axis straightness error of the machine tool in the y-axis observed as 0.0285 mm, which is calculated from the measured values. The maximum positive repeatability detected as 0.0099 mm at target 22, maximum reverse repeatability reported as 0.0197 mm at target 15 and maximum bi-directional repeatability observed as 0.0211 at target 15. Figure 8a shows the mean deviation of the z-axis straightness error in the forward and reverse direction of the y-axis. The values had taken three times in bidirectional on the y-axis to get straightness in x-axis and z-axis. The graph indicated that the machine has a straightness error that could eliminate by doing composition. The squareness error on the x–y plane is measured by using the ball-bar apparatus. The squareness error is positive 86.8 µm/m in the x–y plane; the values were repeated twice in bi-directional on the x–y plane. Figure 9 shows that the machine has a squareness error, which could eliminate by using composition. 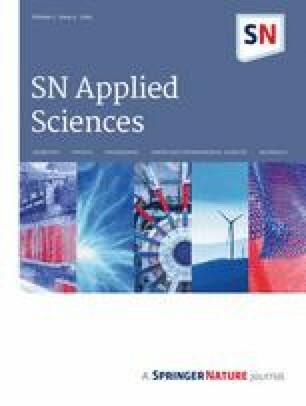 This paper has presented a geometric error measurement method for the computer numerical control three-axis machine tools. The twenty-one geometric errors items of the machine tools were measured based on the laser Interferometer and ball-bar. The ball-bar apparatus measured the squareness error. The positional error, angular error and straightness error of the geometric error were measured by laser interferometer based on the line measurement method. The proposed line measurement method verified on a CNC (computer numerical control) three-axis vertical machine tool. The measurement method has certain advantages as compared to other geometric errors measurement methods (time-saving, accuracy improve by applying for compensation, calculate errors separately and simple way to get precise results). The experimental results were shown in Figs. 4, 5, 6, 7, 8 and 9. 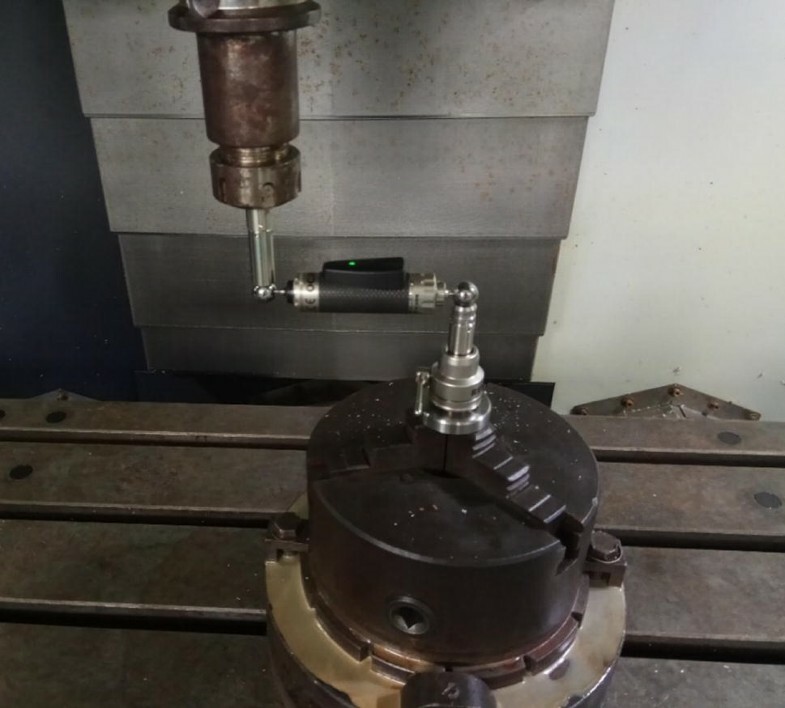 The findings from the above experiments have indicated that it can sufficiently measure the geometric errors of the machine tool, which may be helpful for the mechanical industry. This research was funded by the National Natural Science Foundation of China (Grant No. 51375100), Guangdong Science and Technology Project (Grant No. 2013B011304009).